Save the Date: March Madness -- Final Four - Monday April 8th. 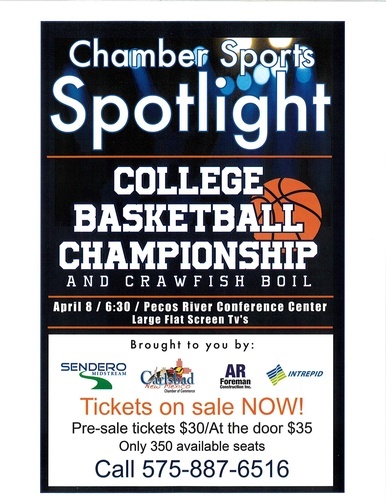 College Basketball Championship Game and Crawfish Boil at the Pecos River Conference Center. Name: Save the Date: March Madness -- Final Four - Monday April 8th. College Basketball Championship Game and Crawfish Boil at the Pecos River Conference Center. © Copyright 2019 Carlsbad Chamber of Commerce. All Rights Reserved. Site provided by GrowthZone - powered by ChamberMaster software.